Reading can be a great way to soothe baby. It is helpful at bed time too. We like to read at night and now my son can read I try to have him read to his sister. Capstone baby books are adorable and have cute illustrations. Parenting can be challenging at any stage of a child's life. So why not make it a little more fun and educational with books. I know my son's school likes us to read for 20 minutes a night. Sometimes we do more, sometimes less. It all depends on his mood. My daughter is at the stage where she just wants to point to all the pictures. I'm happy to be a part of a wonderful giveaway that promotes reading to your children. 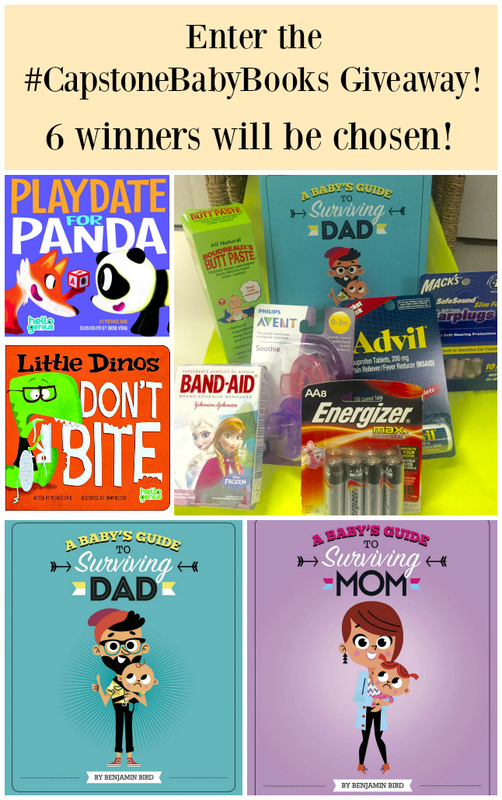 This prize pack includes essential items we need as a parent. Ends 2/5/2016 at 11:59 PM. USA only and 18+. All winning entries will be verified before they are contacted via email. You have 48 hours to respond to or a new winner will be chosen. Looks like a great giveaway. WE love reading in our house. Also, I like finding new books to suggest to friends.